Of course a trip back home wouldn’t be complete without eating some tacos. Few people and couple websites pointed me to Guisados. They recently opened one in DTLA and lucky for me, I was there to check out the Big Gay Ice Cream LA shop. I guess I should’ve done my homework before going to Guisados. Apparently, the better deal for first timers is to get the platter. 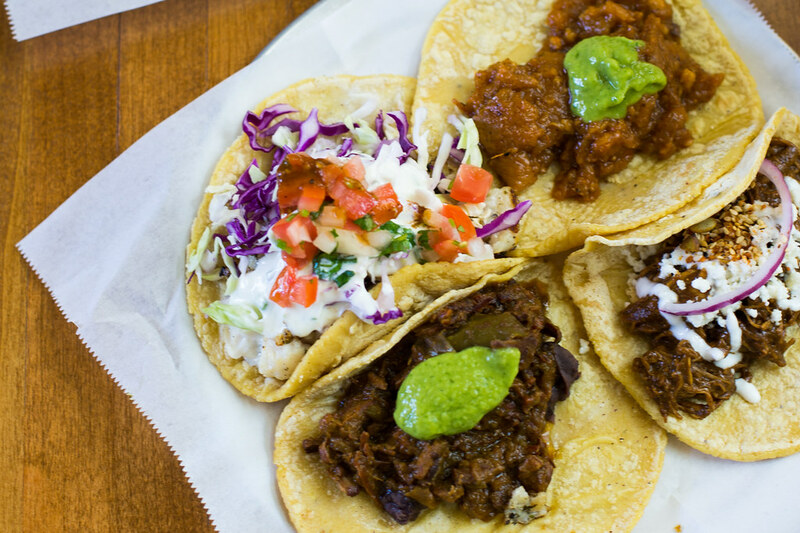 It’s a platter of 6 small tacos which is great to get a feel of the place. Instead, I walked up to the counter and got a steak picado, chicken mole poblano, fish, and chicharron. Let’s start with the not so great and meh. I did not like the chicharron (pork rinds simmered in chile verde) taco. When you think chicharron, you think crunchy and crispy. The chicharron at Guisados was soft because if I had done my homework again I would’ve known that they basically braise and simmer all their taco fillings. Slippery pork skin is not good eats to me. The pescado (grilled fish) taco was alright. I really think that, when it comes to fish tacos, the fish needs to be fried or else it sort of gets lost. Oh man, but the steak picado and chicken mole poblano tacos were pretty darn good. Great flavors and texture, could’ve eaten 2 more of those. The corn tortillas were tasty and thicker than the usual tortillas and I really liked that. My sister told me that they have beef tendon tacos which I want to try, next time I’m home. 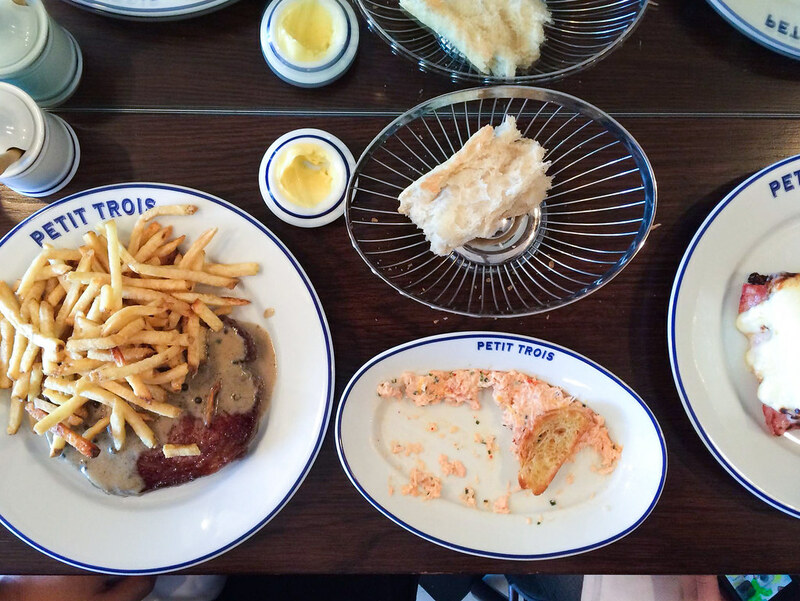 You know the phrase “cuts like butter?” Well I used it to describe the steak I was eating, to my friend while we were having lunch at Petit Trois. Oh wow..indeed. 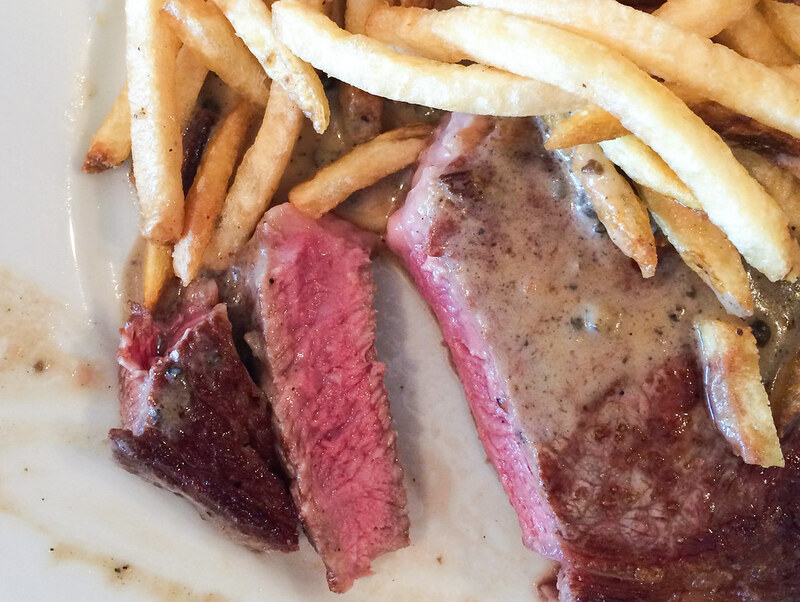 The steak frites ($33), which comes with an onion soup sauce, is major delicious. The steak was tender and rare and fatty. I also could’ve just eaten the free bread and butter, toasty and soft. My friend ordered the croque monsieur which was really good and really heavy. We also shared a plate of the salmon rillettes that I happily slathered it over the bread and butter. I hear it gets crazy crowded during dinner service so if you have a chance, go for lunch. On Monday I posted Allswell’s crispy chicken sandwich, which is currently my favorite fried chicken sandwich (do you have a favorite chicken sandwich?). I also got a chance to spend some time in the kitchen with Nate Smith while he was preparing and cooking my sandwich. Check out some behind-the-scenes photos after the jump! When I first had the idea to do this fried chicken project, I knew that I had to also include fried chicken sandwiches. Because….well because why not? I love a good fried chicken sandwich as much as I love a good plate of fried chicken with biscuits and slaw. 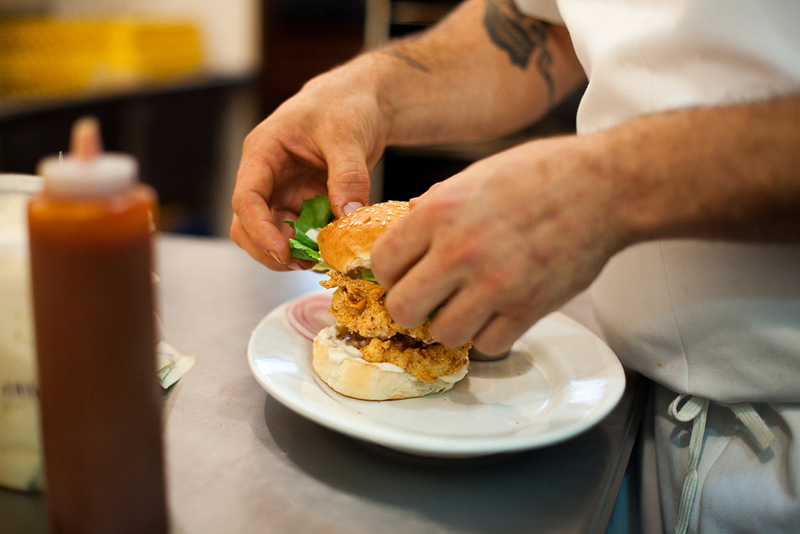 So here’s my first fried chicken sandwich post…. 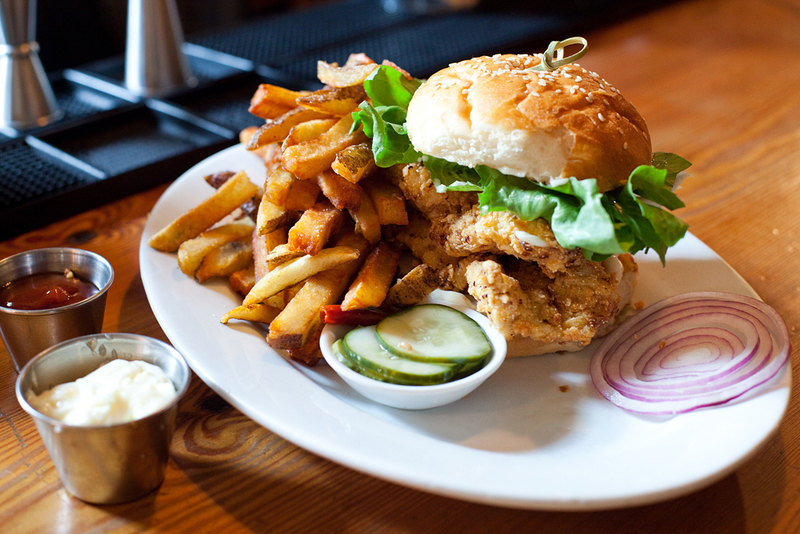 You can find one of my favorite fried chicken sandwiches at Allswell. The pieces of chicken are brine overnight, soaked in buttermilk, plus a coating of flour mixture and fried to perfection. For $13, the sandwich comes with fries (and mayo!) and they are delicious as well. I eat this sandwich everytime I go to Allswell for lunch and it pairs so well with a tasty beer. The sandwich is available during lunch, brunch and late night hours. See what other fried chickens I have eaten for my fried chicken project. 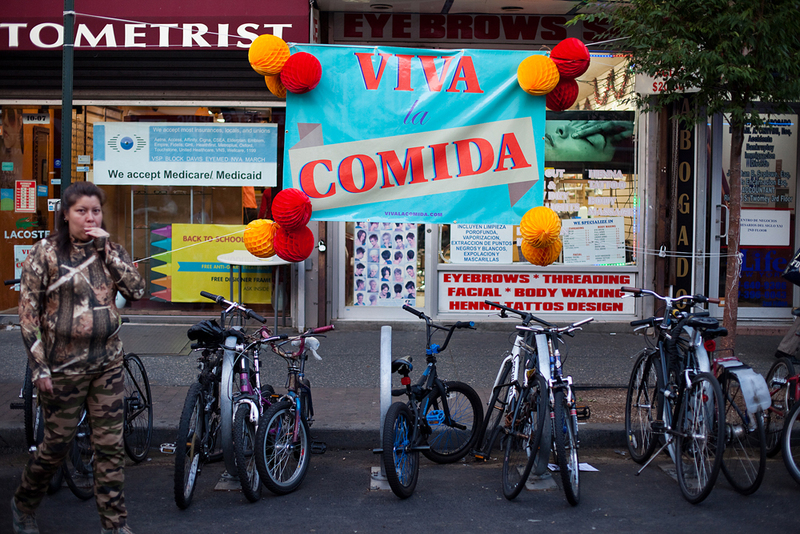 Viva La Comida is back! And this year was a big improvement from last year. I’m not saying last year was terrible…oh no. But certainly there were couple things that could’ve made it better. So what changed? First of all, this year they were able to close of the street completely. Last year everyone had to watch out for cars and buses while in line trying to get food. This year, with the street closed off, there was more room for people to wander around. So with more room, the people in line for food didn’t have to take up the sidewalk like last year. Also, this year, there were benches for people to sit down and enjoy themselves. This is quickly becoming one of my favorite events and definitely a great idea to venture out to Jackson Heights. As I was staring at the bowl of grilled tomatoes, peaches with sweet corn, yogurt and basil, I thought to myself…”wow, this is summer in a bowl” and it was mighty delicious. So my sister was in town for NY Fashion Week and I took her out to dinner. I really wanted to her see and try Glasserie, especially right after the NY Times review that came out last week. Just like the last time I was at Glasserie, right when they opened, Sara Kramer once again blew my mind with her food. And this time, it wasn’t just how freakin good everything tasted but just how BEAUTIFUL everything looked. This is like a food photographer’s dream. It’s Vendy Awards 2013! Once again, we showed our support and appreciation to the hard working street food vendors by over stuffing ourselves. This year the Vendy Awards took place at Industry City in Sunset Park, Brooklyn. It may had been one of the coolest and weirdest place I’ve been to for an event. Though compare to Governors Island, Industry City had more space and didn’t require taking the ferry across (I walked home afterwards, so close!). So it seems the Red Hook vendors are on a roll. For the 3rd year in a row, the top prize went to a Red Hook vendor. 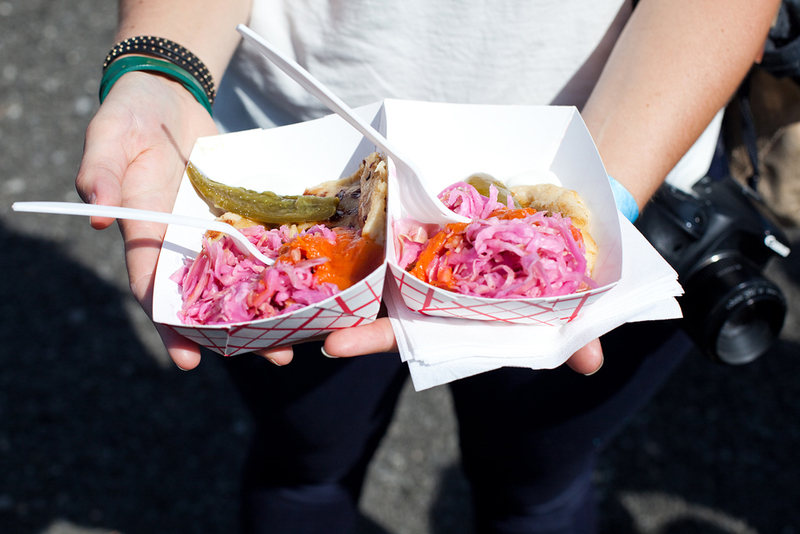 The El Olomega (@elolomega), one of the more popular Red Hook trucks, won the judges over with their delicious pupusas. Hm…..pupusas. Luke’s Lobster took People’s Choice, Nuchas took Rookie of the Year, Home by the Range took the Tide award for Most Messy Yet Tasty plus the award for Best Jersey vendor, Best of Market Vendor went to Khao Man Gai NY and Best Dessert went to Itizy Ice Cream. Check out some photos from this year’s Vendy Awards.